Join us for a 300-hour Yoga Teacher Training beginning summer 2019! 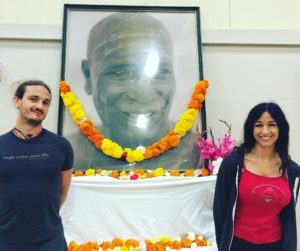 This training is perfect for those who want to expand their knowledge, deepen their own practice, and learn how to teach/share yoga with others. It will be instructed by Sarah Jane and Sammy Brown with special guest teachers TBA . Our teachers have a deep accumulative experience of both practicing and of teaching alike. This program is Yoga Alliance certified. *You must be a Front Climbing Club member in order to participate. This will give you access to unlimited yoga classes, full access to our gym, climbing, and more! Check out membership rates & perks here. A payment plan is available if you would prefer to pay $1,000 on the following dates: 5/20, 7/20, 9/20. Please sign up at the front desk for this option. Payment plans do not qualify for the $300 off early bird deal. The entire Primary Series of the Ashtanga Vinyasa system taught in the traditional format. 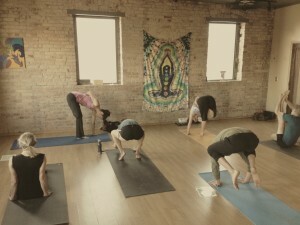 The instructor calls out the posture names and often counts the breaths to encourage a seamless, meditative, guided flow. The class is steadily- paced, so some familiarity with the Primary Series, such as previous attendance to the short forms Mysore class is useful. 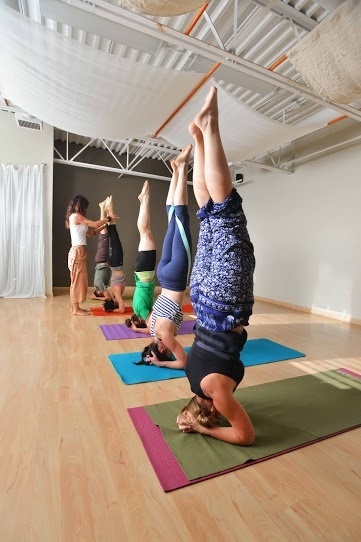 Headstand, Shoulder Stand and full upward bow backbend will be included in these classes, but modifications are readily available for those new to these poses. This practice focuses on lengthening the hamstrings, strengthening the back, shoulders and core and training the mind to be more focused and relaxed. This series has rarely been considered easy, but modifications can be found in each asana for each body. Receive gentle yet effective hands on adjustments. The Ashtanga Yoga method is built around the Mysore style practice named after Mysore, India, where yoga was taught this way by Sri K. Pattabhi Jois. Ashtanga Vinyasa Yoga continues to be taught this way in traditional Ashtanga Yoga schools around the world. 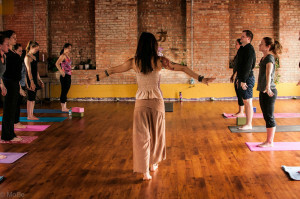 Mysore is unique compared to other asana classes, as each person practices at their own pace without interruption. The peaceful sound of deep breathing permeates the room. The teacher assists, adjusts, gives new poses as the student is ready, and discusses each individual’s practice with them when needed. Those new to Ashtanga are more than welcome, and taught at a pace that helps them take the time to memorize the sequence and learn the postures, breathing and gazing points correctly. Our students are welcome to use a “cheat sheet” (provided in the classroom) with pictures and names of the poses in sequence until they no longer need it. 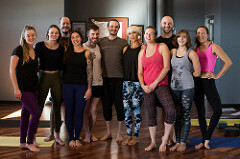 In this all-levels workshop, you will learn the fundamentals of the Primary Series of Ashtanga Yoga, which includes Surya Namaskaras A & B (sun salutations), the standing series, the seated sequence, backbends, inversions, and a more in-depth knowledge of how to do the Ujjayi breath in the closing sequence. Practicing Intermediate Series (or “Second” Series) of Ashtanga Yoga benefits the mind, body and spirit. The body becomes healthier, stronger, leaner and athletic, much like that of a racehorse. The subtle body is purified of energy blockages, creating a sense of wholeness and well-being, and the mind becomes more focused and calm, leading to more mindful decision making throughout the day. Traditionally, this sequence is only taught under the watchful eye of a teacher to those that have attained proficiency in all the asanas of the Primary Series, which can take years of daily practice. These special workshops are designed to offer a peek into the mysterious world of Second Series, offering modifications for all levels in each asana. We will offer new and different twists, forward folds, backbends, hip openers, balancing postures and strength asanas in an intelligently sequenced layout that is rumored to be thousands of years old. It is recommended that participants have completed Primary Series. Sarah Jane is available for private lessons for any sized group or individual lessons at your place or at your choice of yoga studios. These fun and personalized lessons are designed around your wants, needs and lifestyle. Private Yoga therapy sessions are offered for those with health issues or injuries. 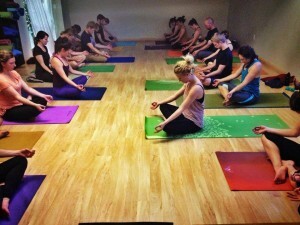 Our lovely Mysore class at Centered City Yoga! with Paramaguru Sharath Jois and Sammy Brown and dear friends from our SLC crew, at UCLA. June 2016! Saraswati is often depicted as a beautiful woman dressed in pure white, often seated on a white lotus, which symbolizes light, knowledge and truth. She not only embodies knowledge but also the experience of the highest reality. Her iconography is typically in white themes from dress to flowers to swan – the colour symbolizing Sattwa Guna or purity, discrimination for true knowledge, insight and wisdom. She is generally shown to have four arms, but sometimes just two. When shown with four hands, those hands symbolically mirror her husband Brahma’s four heads, representing manas (mind, sense), buddhi (intellect, reasoning), citta (imagination, creativity) and ahamkāra (self consciousness, ego). Brahma represents the abstract, she action and reality. The four hands hold items with symbolic meaning — a pustaka (book or script), a mālā (rosary, garland), a water pot and a musical instrument (vīnā). The book she holds symbolizes the Vedas representing the universal, divine, eternal, and true knowledge as well as all forms of learning. A mālā of crystals, representing the power of meditation, inner reflection and spirituality. A pot of water represents the purifying power to separate right from wrong, the clean from the unclean, and essence from the inessential. In some texts, the pot of water is symbolism for soma – the drink that liberates and leads to knowledge. The most famous feature on Saraswati is a musical instrument called a veena, represents all creative arts and sciences, and her holding it symbolizes expressing knowledge that creates harmony. 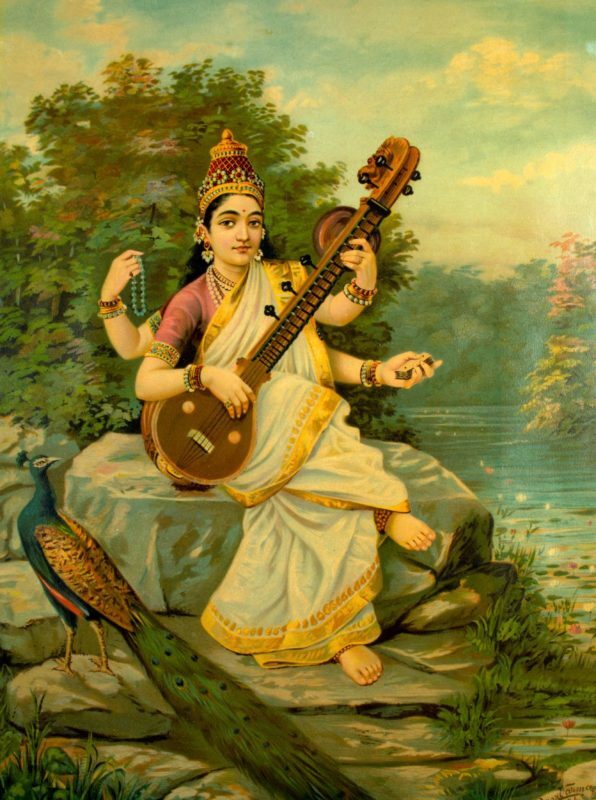 Saraswati is also associated with anurāga, the love for and rhythm of music, which represents all emotions and feelings expressed in speech or music. A hamsa or swan is often located next to her feet. In Hindu mythology, the hamsa is a sacred bird, which if offered a mixture of milk and water, is said to be able to drink the milk alone. It thus symbolizes the ability to discriminate between good and evil, essence from outward show and the eternal from the evanescent. Due to her association with the swan, Saraswati is also referred to as Hamsavāhini, which means “she who has a hamsa as her vehicle”. The swan is also a symbolism for spiritual perfection, transcendence and moksha.